Because of its agreeable, mildly lemony scent, lemon balm is considered an aromatic herb, typically grown in gardens and other landscaped areas for its fragrance and its ability to attract pollinators. Although growing lemon balm is easy because it is a very drought-resistant and hardy herb, some basic care will ensure successful cultivation. 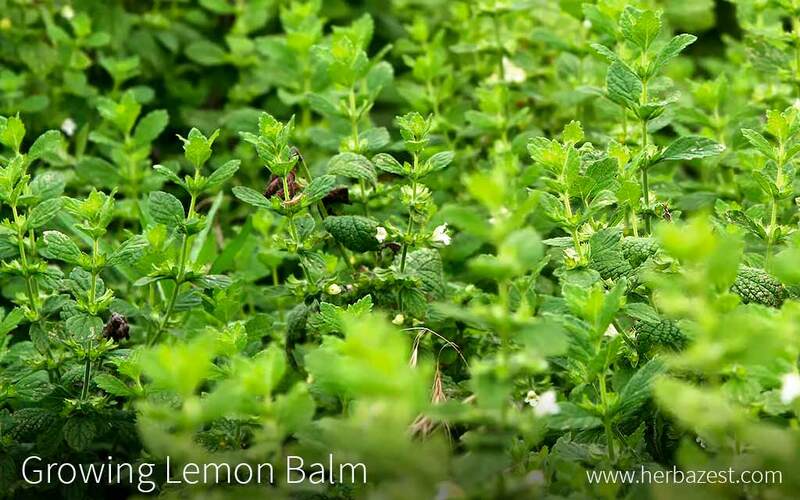 Learn more about how to grow lemon balm and all the care lemon balm needs to bring you its many benefits. Lemon balm is an aromatic perennial that is quite easy to grow and take care of at home. However, temperature, type of soil, and irrigation are some of the factors that can influence its development. The following growing guidelines will help you to cultivate lemon balm successfully. The soil should be properly treated and raked down to form a fine, leveled seed bed in a sunny area. If planting lemon balm in pots, it is preferable to loosen the soil in sandbags before pouring it into each pot. Although they develop best in average, dry to medium, well-drained soils with a neutral pH, lemon balm plants adapt well to a wide range of soils, including poor ones with pH levels ranging from 4.5 - 7.6. Water the soil heavily and then let the excess water drain before planting. Growing lemon balm from seed is the most used and recommended propagation technique for this herb. However, you can also grow lemon balm from cuttings and seedlings. Planting lemon balm seeds is a very easy task, but it should be done no more than eight weeks before the last frost. It is better to sow the seeds in orderly rows in order to differentiate them from other herbs and weeds. A good idea would be to label each row with a waterproof marker. Seeds should be only slightly covered with finely-sifted soil. The soil needs to be firmed down and moistened with a fine spray of water, taking care not to displace the seeds. It should be kept damp but not soggy until the lemon balm plants sprout. For planting lemon balm seeds indoors, you'll need a container two to three inches (5 - 8 cm) deep with good drainage. Seeds can be sown at an even density - but not too thickly - in shallow lines, two to three inches (5 - 8 cm) apart, marked by the edge of a label or a ruler. Using a commercial or homemade mix will avoid weed seeds and diseases usually present in garden soils. The mix should be moistened with a fine spray of water and firmed down lightly before use. The container should be placed in a pan with about two inches (5 cm) of water and removed when the moisture reaches the surface. The container should be covered by a plastic bag and placed in a warm place under indirect or fluorescent light until the seeds germinate. The soil should be kept well-moisturized and needs to be fed every 10 days with a commercial water-soluble fertilizer. Be sure not to overwater the seedling container. Allow drying between watering to avoid wilting. After germination, the plastic cover can be removed and the container exposed to full sun in a window or under fluorescent lights six to eight inches (15 - 20 cm) from the seedlings until they reach a transplantable size. Lemon balm grows best when it is not water-stressed. Keep the soil moist, but not wet, or the plants will get root rot. Supply water through drip or overhead irrigation and mulch around the plants to conserve soil water. Lemon balm responds to general all-purpose fertilizer. Feed it in the spring to encourage new growth and again after harvest to encourage additional leaf growth. Over-fertilization causes excessive growth and poor flavor development. In order to prevent invasive growth, lemon balm care should include frequent pruning and planting in containers. Removal of spent flower stalks will also encourage new leaves to grow and intensify their fragrance. Unpruned plants may acquire a weedy appearance. Thinning lemon balm plants in the summer will improve air circulation. This is done by simply snapping the stems off from the base. To remove browning, you can trim two inches (5 cm) all around the plant. In just a few days, new growth will appear. If planting lemon balm in the garden, harvest the leaves regularly, remove the flowers before they set seed, and dig around the plant edges to reduce root spreading. Weed control is very important because the presence of unwanted herbs in the dried product will reduce the quality of the yield. Lemon balm does spread rapidly and can become invasive. Growing plants in containers can help control this problem. One of the advantages of growing lemon balm is that, because of its high natural oil concentration, this herb is generally free from insects or diseases. However, powdery mildew and root rot can arise from over-watering. Occasionally, aphids and mites may also affect lemon balm growing. Because it is a perennial, harvesting lemon balm is possible all year around in temperate climates, and from spring to fall in colder zones. This job is typically done by hand, and frequent harvest will keep lemon balm bushy and compact. To make the most of lemon balm's essential oils, it is better to harvest the leaves during summertime in the morning after the morning dew has dried to obtain the highest concentration of essential oils. Harvest about one-third of the foliage at monthly intervals to encourage healthy growth, before the plant starts to bloom, being careful not to bruise the leaves. After harvesting lemon balm, the the stems in a bundle and hang them indoors, out of direct sunlight, or in a shady place to dry at room temperature. Carefully strip the dried leaves from the stems and store them in an airtight container in a dark, dry place. They can also be stored in the refrigerator for a few days or in double-bagged food storage plastic bags in the freezer for the short term. Fresh and chopped lemon balm leaves can be frozen in vegetable oil and used as a cooking ingredient. Another option is freezing the whole or chopped leaves in ice cubes. This way, they can be added to refreshing beverages or infusions.